The Pennsylvania State Board of Education is “weighing” the benefits of eliminating unhealthy foods from school vending machines, cafeterias and fundraisers to combat childhood obesity. As the board holds hearings on the subject, students are already expressing their displeasure. “I buy French fries almost everyday, they can’t take them away,” senior Krista Conlin said. Don’t fuss about losing fries just yet, Penn Manor’s cafeteria already switched to zero trans fat oil about four years ago when they got a whiff of the direction government was going in its efforts to slim kids down. 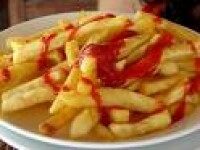 French fries may only have one-falf gram of trans fat per serving under proposed state regulations. They may have to cut a little more with the new regulations. “Food items containing vegetable shortening, margarine or any kind of partially-hydrogenated vegetable oil unless the label required on the food, pursuant to applicable federal and state law, lists the trans fat content as less than 0.5 grams per serving,” the regulations state. Randy Wolfgang, Penn Manor’s Food Services Coordinator, is aware of the changes being proposed by the state. If the proposal passes, Pennsylvania will be one of eight states that are changing the nutrition and physical endurance guidelines of school students. Many Penn Manor students are not happy with the new proposed regulations. But news of a down-sized cookie is not any more popular than the idea of cutting back on lemonades or deep-fried food. The big cookie may not be so big next year at Penn Manor or any other public school if proposed state regulations take effect. The new requirements will require that beverages have 67 or less calories per eight ounces, will replace all milk with skim milk or one percent milk, prohibit energy drinks as well as food with 35% or higher calories from sugar. Not only does the state Board of Education want to eliminate high fat food, but they also aim to require at least 30 minutes of physical activity from every student, every day. As for elementary students, if this regulation passes, they will be required to have 150 minutes of physical activity each week. Now that’s an idea that makes physical education teachers very happy. “I agree with adding physical activity to schedules, although it involves more work with course scheduling. But I don’t know about the food changes only because we have a good variety of food in our cafeteria. It isn’t all healthy food, or all junk,” said Penn Manor school counselor, Marjean Long. The board has held hearings on the regulations in April and plans to vote on the changes during the first week in May. HAHA did anyone catch the joke in the first sentence where the word “weighing” was used? I literally laughed 6 minutes straight. It was so funny!! um…really? the state is funny…PSSAs, Keystone Tests, and now lets make the population skinnier? I doubt people are going to appreciate the implications of this. I would have no problem eating healthier. I refuse to drink skim milk. I would rather die. I also refuse to drink skim milk, which is basically water. Whole milk is the way to go.